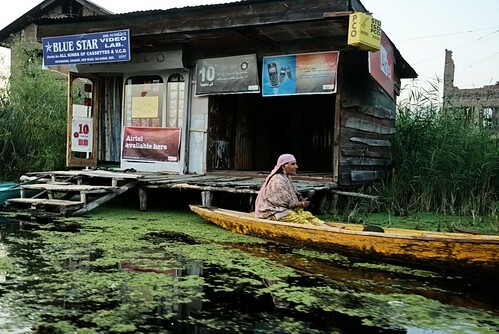 Life on the lake: Dal lake, Srinagar, Jammu and Kashmir. Part of 'The Trip/2007', Aug/Sep/Oct/Nov. After taking the not so dangerous road from Killar, we were passing through Kishtwar late in the afternoon when we saw a direction board saying the road to the right went to Anantnag; Anantnag being a town on the way to Srinagar where we were heading the next day, and seeing a new road and that too a shortcut had us immediately making the turn and stopping at a tea shop to confirm the direction and the road. We learnt that it was a road that went through Singtam Top and there were a lot of checkposts on the way. We started off and soon reached the first army checkpost at Bhandakot and had to show ID cards and answer questions on what we were doing there and where we were heading, where were we from before they let us through; the security here is strict: a mini bus that went in front of us had to stop and all the passengers had to get down and undergo inspection before the bus moved forward. 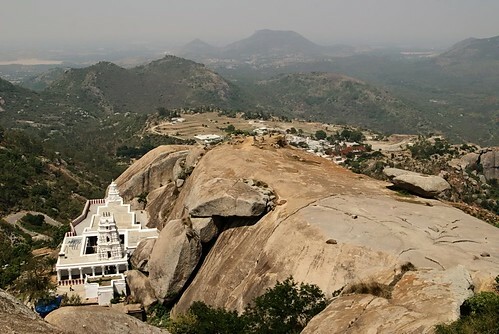 And this was just the first one, the next town had an STF checkpost where they doubted whether our long backpacks carried any guns and one of them took me to the side and told me that since my name sounded Hindu it was not safe to go ahead. After crossing another army checkpost, we were at Chchatru, from where we had to return: the person at the police station informed us that there was no army presence for many kilometers after Chingam and that was where we could be caught at gunpoint and that would mean they would have to come searching for us and so he would not allow us to go any further; even though Sumos and mini-buses run this route. 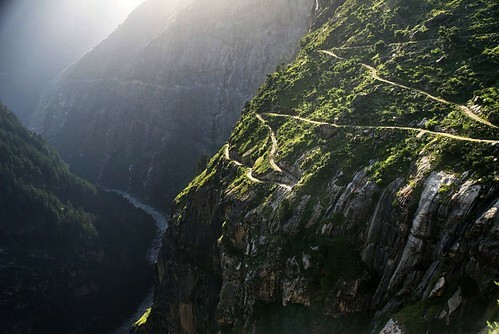 Road, mountain ,cliff, river: somewhere on the way from Himachal Pradesh to Jammu and Kashmir. We left Killar after the I-day celebrations at around three in the afternoon. We had been informed that the road we were planning on taking towards Keylong had been blocked for some time now due to a landslide and the only option(other than taking the road back through Sach Pass) was to go towards Jammu and Kashmir; and as it turned out this was one experience we wouldn't mind doing all over again. In a tram: going on a random tram ride in Kolkata, West Bengal. 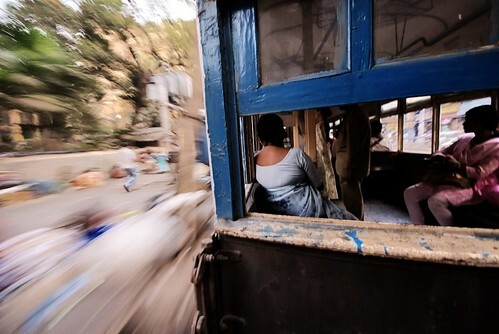 There are no dearth of options on how to get around in Kolkata: starting from the hand pulled rickshaw, the cycle rickshaw, the shared auto rickshaws, the buses and the trams to the underground metro, not to forget the ever visible yellow ambassador cabs. The tram is something that is unique to Kolkata and we made it our agenda one afternoon, taking a random tram and going around. 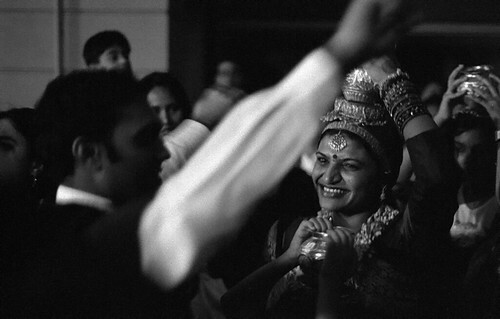 and that ends the series of posts from the 'Kolkata, Feb 2009' set. 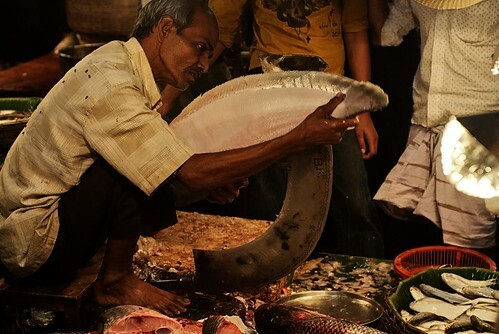 Big fish, big knife: Manicktala Fish Market, Kolkata, West Bengal. After the visit to the Vintage and Classic Car Rally and breakfast at a Mistan Bandar, we made a short visit to the Manicktala Fish Market. Ayan tells us that this is one fish market where it is impossible to buy bad fish. Though we only spent a little time there we could see the place was full of action, all sizes of fish being descaled, cut and sold with the help of different knifes. The whole place was lit by bulbs with spotlights, and while there were a few proper spotlights made of metal, most of them were made from inverting shiny paper plates on top of the bulbs; metal or paper it was clear the spotlight was on the fish and nothing else. Dressed for the car: Vintage and Classic Car Rally, Kolkata, West Bengal. The Sunday we were there in Kolkata was the day of the annual Vintage and Classic Car Rally organized by The Statesman. The cars started arriving just before seven in the morning at the Rabindra Sagar Stadium, collecting their goody bags at the gate and then parking at their designated places. It took more than an hour and a half for the more than 120 cars to arrive and be ready to roll out for a ride on a designated route after the inauguration ceremony. There were three cars from before WW I and a few bikes too. It was a pleasure seeing them so well maintained. Eye to eye: Kumartoli, Kolkata, West Bengal. 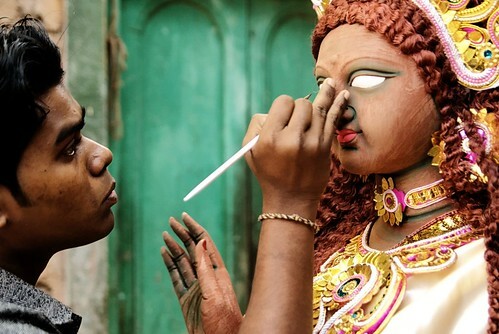 Kumartoli is an area in north Kolkata dedicated to making idols where the artisans keep themselves busy almost the whole year making murtis for festivals. The people here are busiest in the months leading to the Durga Puja in October but we caught another busy scene on the day before the Saraswati puja when we were in Kolkata. 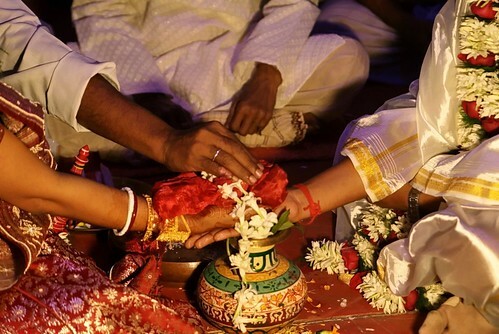 Bengali Wedding: at a friend's wedding in Kolkata, West Bengal. A friend's wedding a couple of weekends ago resulted in a trip to Kolkata; taking a couple of days off along with the weekend gave us an opportunity to see a few things in Kolkata including visiting the Kumartoli area, seeing a few vintage and classic cars and bikes and taking random trams around(more posts coming up on these). Of course we did not miss any opportunities to gobble up some good food; at the wedding the guests were required only to munch on the provided snacks and then have dinner :) We did eat at a few places near the New Market area and the most food we had was at Bhojohori Manna which was recommended by Ayan, where we had no reason to stop ourselves from having the delicious Misti Doi, Aam Doi and Rasmalai, and these after a full meal.